The settlement of New Netherland by the Dutch West India Company (1621-1664) on the western side of the Hudson River contributed several locations and place names that would become part of present-day Jersey City. They are Pavonia, Communipaw, Harsimus, Paulus Hook and Bergen. After the forfeiture of land holdings at Pavonia by Michael Pauw in 1633, the Dutch West India Company named Michael Paulusen, or Paulaz, an agent for the Pavonia settlement. It is from his name that the name Paulus, and sometimes Powles, Hook is derived for the original area of Aressick. The word hoeck in Dutch means hook or point, thus Paulus Hook. Paulus Hook was a small island, separated on the west from Harsimus Island by a marsh with a stream. Local historian Joan Lovero reports that during the age of settlement, " . . . Paulus Hook rose several feet above water level and was separated from the land at its west by a creek that was navigable at high tide" (9). It was later connected with the mainland by a causeway over the marsh. Local historian Walter F. Robinson adds that Paulus was "then an earthen embankment (now lower Newark Avenue) across the marsh to Harsimus Island, then a road (now Railroad Avenue) westward over Harsimus to Prior's Mill bridge and the mainland. This quickly became a busy part of the main post road from New York to Philadelphia" (Old Bergen Township, n.p.). Its waterfront location also gave Paulus Hook its somewhat derogatory reference as Gammontown. It is derived from the Dutch word gemeen. An Internet search on Woxikon.com reveals an array of definition from "awful" and "mean" and "malicious" to "vile." This may have conveyed what Helene Stapinski, in her description of the area, historically details: "Since the neighborhood was close to the water, it was often invaded by rats. Not the most desirable place to live" (28). By the 1760s, Paulus Hook was noted for its stage coach and ferry service. A descendant of the first Cornelius Van Vorst, Cornelius Van Vorst (1728-1818), known as "Faddy," was partly responsible for the development of the ferry business. His ferry line ran from Paulus Hook to Cortland Street, New York City. He had three flat boats for wagons and coaches and smaller boats for passengers. His mile-long circular racetrack also brought business from the New York as well as the New Jersey side of the Hudson River. In the interest of these patrons, Van Vorst constructed a tavern at Paulus Hook with Verdine Elsworth as proprietor. It was a one-story building with a Dutch roof and eaves, overhanging a porch that faced the river, where one now finds Grand and Hudson Streets. The location of Paulus Hook would have strategic advantages as evidence of a struggle between Britain and her American colonies became more apparent. Even before war started, General George Washington had ordered a fort built at Paulus Hook to defend New York across the Hudson River from British attack, to guard the Hudson River channel, and to control the Bergen peninsula to Bergen Neck (now Bayonne). For example, on April 2, 1779, British soldiers from Paulus Hook traveled to Bergen Neck and attacked and captured the patriot soldiers stationed there. The first six months of the war brought a succession of failures for General Washington. American forces were defeated at the Battle of Long Island in August 1776, and Washington's army of 10,000 men evacuated Brooklyn Heights across the East River. On September 15, the British then claimed New York and turned their warships on Paulus Hook. On September 23, 1776, Paulus Hook had to be abandoned. Munitions and supplies were removed to Bergen Town. The fort became the first New Jersey territory invaded and occupied by the British. It remained under British control until the end of the war. It was held by some 200 Tories under Lieutenant Colonel Abraham Van Buskirk of Saddle River and what was called an "invalid" regiment. 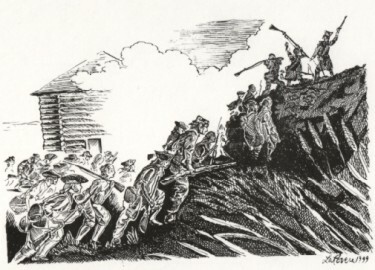 Raids on the fort by patriots occasionally took place. On August 18, 1779, Major Henry "Light Horse Harry" Lee, a 23 year-old graduate of the College of New Jersey (now Princeton University, left Paramus. He led his 300 war-weary Continental soldiers through the marshes to Harsimus Creek and Island (now Pavonia), and launched a surprise pre-dawn attack upon the British Fort at Paulus Hook. As a result of a delay and rising tide affecting the crossing of the marshes, Lee settled on a two-column, rather than a three-column as planned, attack at 3:30 a.m. on August 19. Lee was met by the British 64th Regiment stationed at Paulus Hook. Despite problems of water damage to ammunition, Lee's forces took most of the fort in the "hit and run" operation ordered by Washington. After approximately thirty minutes, Loyalist dominance in area resulted in a retreat by Lee although his 150 soldiers killed 50 and took 159 prisoners. Lee feared continued fighting would signal British arrival from New York. Lee moved his troops out past Prior's Mill across Bergen Square and down Middle Road (now Tonnele Avenue) to the Hackensack River. At the conclusion of his study of the Battle of Paulus Hook, Walter K. Robinson claims, "it was one of the most brilliant and daring exploits in the war. . . . it boosted American morale everywhere" (49). Although Lee was not successful in regaining Paulus Hook Fort from the British, the Continental Congress awarded Lee a gold medal, exceptional at the time, for his daring maneuver. The British did not evacuate Paulus Hook until the end of the war on November 22, 1783. Today, a battle monument in the park, at the southeast corner of Washington and Grand Streets, commemorates the Battle of Paulus Hook, fought by the patriots against the British in August 1779 hoping to regain the fort. Two restored adjoining 1850s brownstones at 199 Washington Street in the historic district bear the name of the war hero as the Light Horse Tavern. New Jersey historian John Cunningham comments that after the war Paulus Hook was a sparsely settled marshland with only a ferry house, lobster shanty, and "a few outbuildings" (New Jersey 124). However, Alexander Hamilton, the former Secretary of the Treasury under President Washington, saw potential in this undeveloped area. In 1804, he helped organize the Associates of the Jersey Company and leased the land. 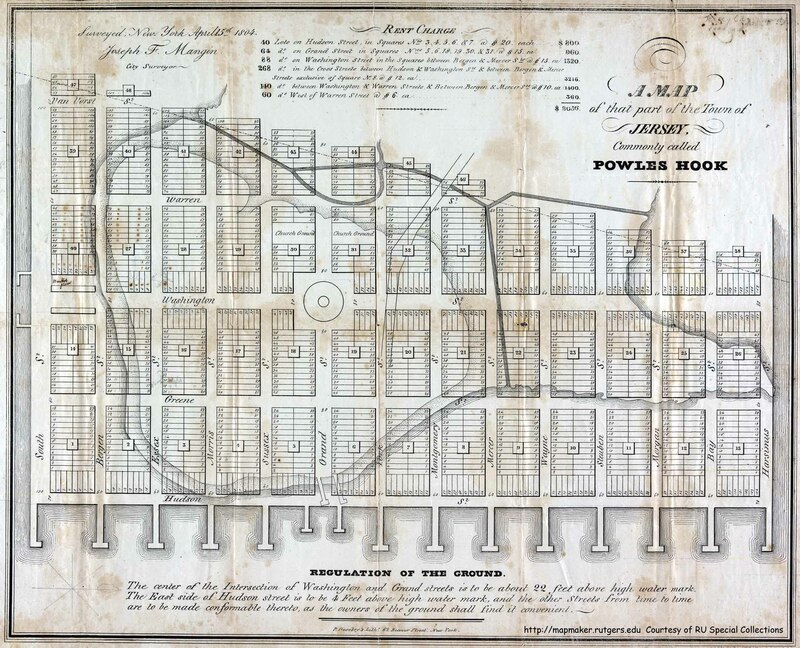 Paulus Hook was subdivided into lots for sale and for distribution free to churches. However, competition from New York City, poor business management, and the untimely death of Hamilton affected the future of the project. In 1812, the engineer and steamboat developer Robert Fulton, also saw the advantageous location of Paulus Hook for commerce. He started a ferry service between New York and Paulus Hook. His steamboat the Jersey took approximately fifteen minutes across the Hudson River. During the early nineteenth century, the railroads were responsible for filling in the remaining marshland that transformed it into a waterfront industrial site with factories and rail yards. Ferry traffic carried raw materials, brought by rail to Jersey City, across the Hudson River to New York. 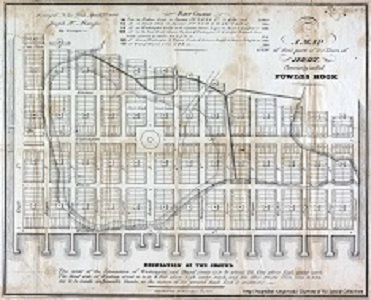 This approximately half square-mile in Jersey City's First Ward developed throughout the nineteenth century with companies such as P. Lorillard Tobacco, Colgate-Palmolive Company and American Sugar Refining (Sugar House). Immigrants moved into the area and lived on blocks neighboring Grand Street; it was a main street that had trolley service for the local residents. Single family brick row houses were converted to multi-family tenements to meet the population growth. It was in this neighborhood that the social reformer Cornelia Bradford began Whittier House, a social settlement house, in response to the arrivals of immigrants in the 1890s. Today the Paulus Hook Historic District has retained many of it brownstones, churches, apartments, and factories. New town houses and apartment complexes have been built in the Upper New York Bay area, vying for views of Manhattan and the Statue of Liberty. The Hartz Mountain Industries built two-twelve story towers in the Colgate Redevelopment Area and the Applied Companies completed the Portside apartments. The Sugar House, along the Morris Canal basin, was renovated by Diversified Management Systems, and today it is a sixty-four unit condominium and opened for occupancy in June 2001. Other notable sites are the Guarantee Title & Trust Co. Bank, the Jersey City Main Post Office, Provident "Old Beehive" Bank and Hudson County Korean War Memorial installed at the foot of Washington Street in 2002. Boundaries for the Paulus Hook Historic District are Montgomery Avenue, Essex Street, Greene Street, and Marin Boulevard. 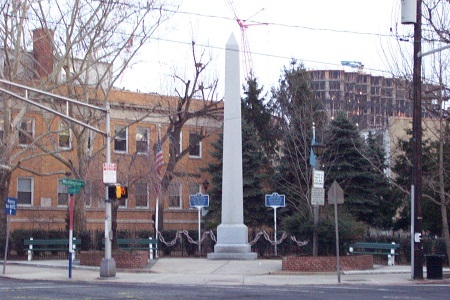 The Paulus Hook Monument is at the intersection of Grand and Washington streets. The 25-foot obelisk of unhewn granite was installed in 1903 through the efforts of the Daughters of the American Revolution in honor of the battle led by Col. Lee on the Paulus Hook Fort. It remained in placed until the 1930s when it was struck by a vehicle in the every increasing traffic in the area. Decades later it was found among some debris and reinstalled in the present-day pocket park in the historic district. Cunningham, John T. New Jersey: America's Main Road. New York: Doubleday & Company, Inc., 1966. Lovero, Joan D. Hudson County: The Left Bank. Sun Valley. CA: American Historical Press, 1999. "Recalling Paulus Hook: Jersey City's Revolutionary Battle." New York Times 20 August 1879. 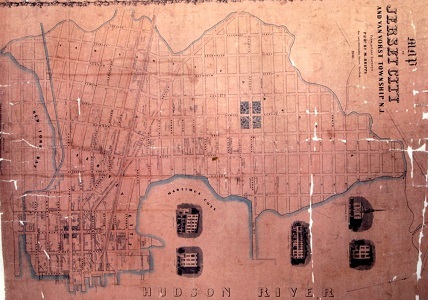 Robinson, Walter F. Old Bergen Township (Now Hudson County) in the American Revolution. Bayonne, NJ: Keystone Printing Company, 1978. Spadora, Brian. "Vets Dedicated Hudson County Korean War Memorial." Jersey Journal 9 December 2002. Stapinski, Helene. Five Finger Discount. New York: Random House, 2001. 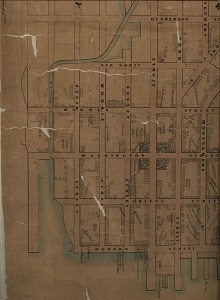 Detail of the Douglas Map of Jersey City, Harsimus, and Pavonia from 1841 which shows the 1804 grid plan with evidence of urban growth on Paulus Hook. which shows urban development in both Paulus Hook and Van Vorst Township. Commemorative postcard reproduction of the Revolutionary War era Ratzer Map. 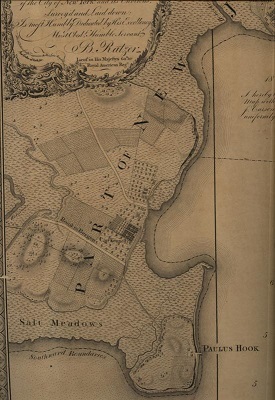 Details reveal the topography of the Paulus Hook area around the time that the property was purchased by the Associates of the Jersey Company in 1804. 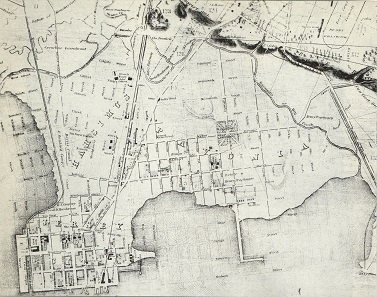 Paulus Hook itself can be seen on the lower right, surrounded by the salt marshes which separated it from the mainlaind. Artist's Rendering of the Battle of Paulus Hook circa 1779. Artist's Rendering of the Fort at Paulus Hook circa 1776. Detail from "A Map of that part of the Town of Jersey Commonly called Powles Hook", Joseph F. Mangin, City Surveyor, April 15 1804. Credits: Historical Maps of New Jersey site of Rutgers University and the Rutgers University Libraries Special Collections Division. Washington Square Park at the intersection of Washington and Grand Streets.